"Creamy mascarpone cheese can be made at home with ease. Use it in your favorite Italian recipes or enjoy on toast with jam. Enjoy immediately or place the finished cheese in a covered container and refrigerate for up to 2 weeks." Scoop curds into a sieve lined with several layers of cheesecloth using a slotted spoon. Fold the edges of the cheesecloth over the curds and let drain over a bowl at room temperature, about 1 hour. 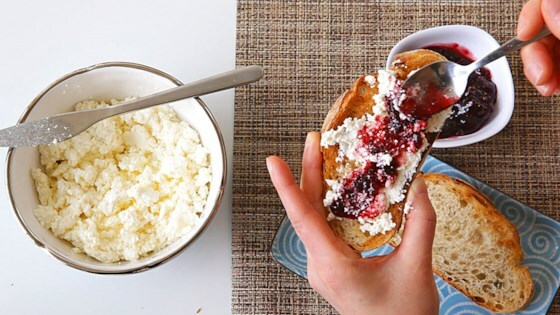 Watch how to make mascarpone cheese at home! You can find tartaric acid online or in specialty shops, such as those specializing in confectionery or home-brewing. If you don't see curds forming in step 1, add a tiny pinch more of tartaric acid and stir for another 5 minutes. Don't add too much tartaric acid at once, or your cheese will become grainy. This didn't work out for me. I followed the method, yet, all I got was a mayonnaise-like consistency. I had to use much more than 1/8 tsp. I will try this again, though. Thank you for the recipe.